Roses For Amy Winehouse and Roses for me. This beautiful flowers have thorns, just as my jacket has studs. 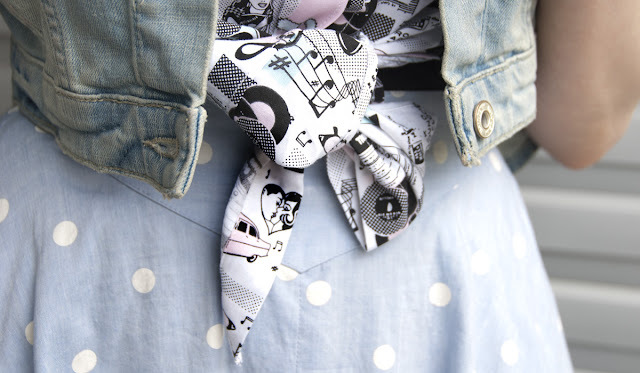 Besides the studs, the whole outfit is pure romance:Pastels, Polka dots and a beautiful comic print. 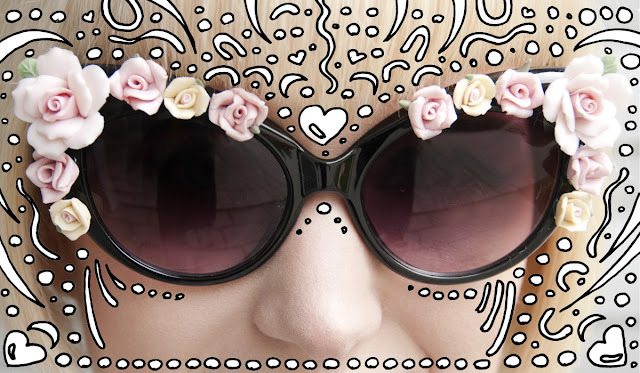 Why did it never occur to me before to decorate sunglasses? I can't understand anymore why they have to be plain. the answer. At the moment it says yes. It slightly starts to rain, but that's no reason to stop smiling! Especially not with an umbrella fitting to the outfit. 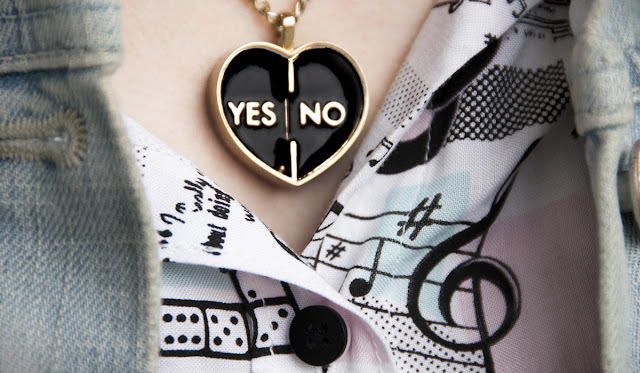 A pink car, hearts , kisses, a jukebox, records and dices: A part of Amy's life on my blouse. Shoes fit for a princess and rain. They are made of my favourite material: Plastic. It's more than a year since Amy Winehouse died. I always admired her remarkable voice, but more than that I loved the picture of her being in that beautiful house in Camden. Amy sitting in dusty bars and pubs, buying something late at night in a corner shop. Camden is one of my favourite parts of London and for me, Amy is a shining symbol of this place! That's why I couldn't resist to buy a Amy Winehouse for Fred Perry knot blouse. I love the retro look of it. It shows pink Cadillacs, a kissing couple, records, music notes and dices, all drawn in a beautiful comic style. The Amy Winehouse Collection has been designed by Amy herself and was released after her death. Camden is famous for it's punk style. So I thought I needed at least one edgy piece to go with my outfit and chose a studded denim jacket. In the end, just something vintage was missing, cause there are many cool vintage shops in Camden too. In fact Camden is where I came to love vintage and discovered the first of this kind of shops. I choose an amazing polka dot skirt from Blenda Vintage (Zurich). It makes a wasp taille and I think it looks like it was made to be combined with the blouse. I am especially proud of my glasses, because I decorated them myself after a DIY found on Honestly…WTF, my one and only favourite DIY blog. They are inspired by D&G's fall collection and it's very easy to make them on your own. I just ordered a pair of cat eye glasses on Ebay and some beautiful ceramic flowers on Etsy and used a little bit of glue to bring this things together. 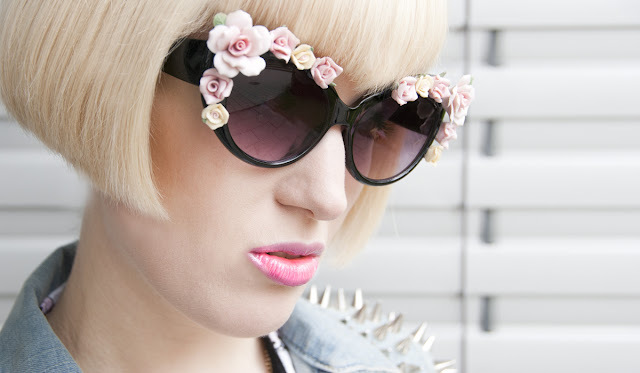 If you wanna have your own flower glasses as well, just go for plain glasses and keep in mind that they should have a broad frame. Do I have any Amy Fans among my fans and what do you think about my outfit and glasses? I absolutely adore your glasses! I've created a blogroll and I'd like to give you a spot in it, would that be okay for you? Thx so so much for your lovely comment :') I totally love your flower sunglasses! So cute and special! Ohh, wow! Just excited photo. Thanks for posting it. wow- you're amazing. I love how potent & pure you style is. That's a shame that the top you bought is too big, I got mine in an adult size small, and it is still big! I have to roll up the sleeves and tuck it in aha! And the shoes made me think of Cinderella!! Die Brille sieht so toll aus, und sie passt perfekt zur Jeansjacke.